Welding exhaust high temperature fume extraction ducting is designed specifically for improved indoor air quality. 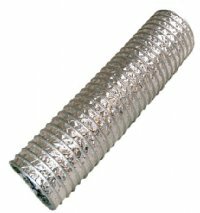 This single ply heavy duty duct provides high temperature service and extra durability. This welding exhaust duct is constructed with a non-glue construction and a flame-retardant fabric. Bend radius = 1.5 x I.D. Weight: 6" I.D. =.8 lbs/ft.